Before football was a national Sunday obsession, the first professional games were played throughout Ohio in Cincinnati, Dayton, Portsmouth, Akron, Ironton, Akron, Canton, Massillon and other towns. “Before The League,” Time Warner Cable SportsChannel’s new six-part series, looks at the kick off of pro football to celebrate the 95th anniversary of the American Professional Football Association, forerunner to the NFL. 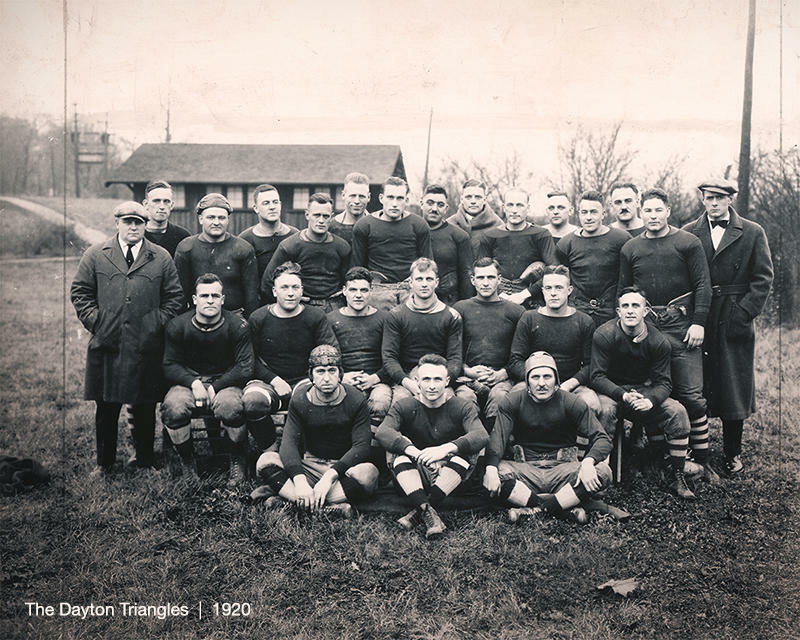 The first NFL game was played in Dayton on Oct. 3, 1920, when the Triangles defeated the Columbus Panhandles. With rare photos, film and some re-creations, the documentary looks at the violent early years of the game, and the origins of small town teams like the Triangles, Portsmouth Spartans, Ironton Tanks, Massillon Tigers and Canton Bulldogs, plus the Buffalo (NY) All-Americans, Rochester (NY) Jeffersons, Milwaukee Badgers and Green Bay Packers. This four-minute trailer gives you a good feel for the film, but there is no mention of Cincinnati’s first pro team, the Cincinnati Celts, in the 1910 Ohio League. The team folded in 1923. “Before The League” devotes entire shows to the scandals, ringers, and first big stars, including African-American Charles Follis for the Shelby (OH) Blues in 1902, and 1912 Olympics hero Jim Thorpe , the Canton Bulldogs player-coach, Reds outfielder and first president American Professional Football Association in 1920. “Before the League” will air on the Time Warner Cable SportsChannel nationwide Nov. 17-18. It’s Channel 1311 and 311 in Ohio, and Channel 510 and 511 on former Insight systems in Northern Kentucky.